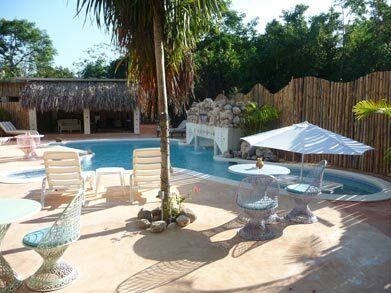 From now till the end of October 2011 you can book a "fan" room at Catcha Falling Star Gardens for just $49US for 2 people. A fan room is a nice way of saying NO AC! But if you're down for cooling off in the shower or the pool, then this place could be for you. A nice bonus includes breakfast in that $49 price. Google Map. So do the math...a couple could stay there for 7 nights and the cost would only be $343 bucks. True, you need to feed yourself lunch and dinner but it'd be pretty cool to take in a few local restaurants you might not get while staying at one of the big resorts. 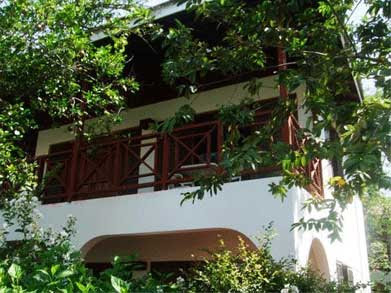 What Catcha Falling Star Gardens is is a small hotel within a lovely garden setting located on the famous West End road of Nergril, Jamaica. There is a popular restaurant across the road, which provides seaside dining and entrance to and from the ocean, and is the place where you can savor delicious dining and exotic thirst quenching tropical refreshments. Enjoy a free and easy atmosphere and sample your favorite cocktail. Check out their official website at: www.catchajamaica.com.